The Greater Scranton Chamber of Commerce, in partnership with The University of Scranton’s Small Business Development Center, has launched the Small Business Internship Fund, which supports internships for college students enrolled at a Chamber member college or university at chamber member businesses meeting program criteria. At the Jan. 18 announcement are, Bob Durkin, president, Greater Scranton Chamber of Commerce; Jerry Musheno, Esq., member of the Greater Scranton Chamber of Commerce board of directors; Lisa Hall Zielinski, director, The University of Scranton Small Business Development Center; and Patrick Fricchione, Jr., vice chair, Greater Scranton Chamber of Commerce board of directors. The Greater Scranton Chamber of Commerce, in partnership with The University of Scranton’s Small Business Development Center, has launched the Small Business Internship Fund, which seeks to place the area’s best and brightest students in Chamber member businesses. The fund will offer up to $500 in matching support to eligible Chamber member businesses to provide internships to area college students who meet the program criteria. This program, announced Jan. 18, was funded by the business community through the sponsorship of the Chamber’s 150th Anniversary Celebration. Those wishing to participate in the program must be for-profit business members in good standing of The Greater Scranton Chamber of Commerce and meet the United States Small Business Administration Size standards. Students participating in the program must be residents of Lackawanna County or enrolled at a Chamber member college or university. “Northeastern Pennsylvania is home to some of the best and brightest young minds in the country. I am pleased to see The Greater Scranton Chamber of Commerce is working with The University of Scranton Small Business Development Center investing in these future leaders with the hope that we can continue to grow and retain talent in the region,” said U.S. Senator Bob Casey. 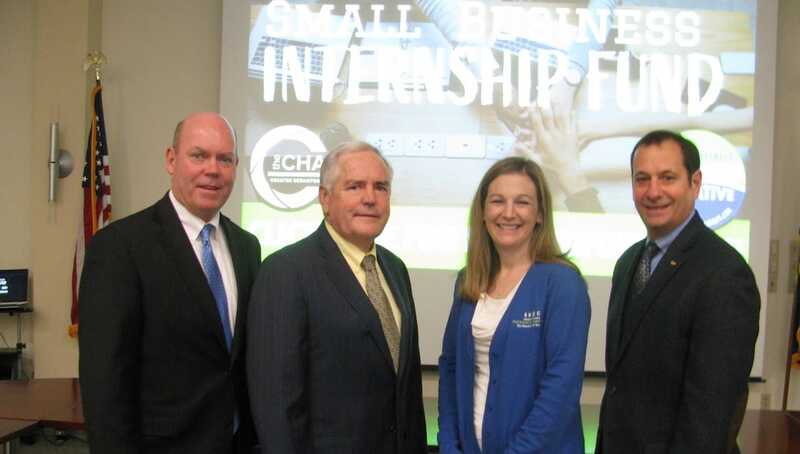 For more information about the Small Business Internship Fund, visit www.scrantonchamber.com/internship. Established by The University of Scranton Small Business Development Center (SBDC) in 2013, the Small Business Internship Initiative offers entrepreneurs the opportunity to grow their businesses with the help of local student interns, while providing students access to experiential learning close to campus. The SBDC provides confidential guidance to help clients determine whether hosting an intern is the right option along with assistance in preparing internship descriptions, guidance with conducting interviews and supervisory skills, and more. Internship opportunities are shared with Career Development partners and students at 11 regional colleges & universities and posted on smallbusinessinternships.com. Founding Partners include The University of Scranton Office of Community Relations, Lackawanna County Commissioners, The Greater Scranton Chamber of Commerce, The City of Scranton, Scranton Tomorrow and the Career Development Departments at Clarks Summit University, Johnson College, Keystone College, Lackawanna College, Marywood University, Penn State Scranton and The University of Scranton. The Greater Scranton Chamber of Commerce is a not-for-profit organization that works to improve the area’s economic environment and quality of life by providing programs and services which stimulate economic growth, promote business prosperity and nurture educational opportunities. For more information about the Chamber, visit www.scrantonchamber.com.